by Brianna Crandall — November 12, 2018 — Worldwide cleaning technology provider Kärcher introduced a variety of new cleaning products and technologies during the recent ISSA Show in Dallas, Texas, including the company’s first robotic floor cleaner, which earned two awards. 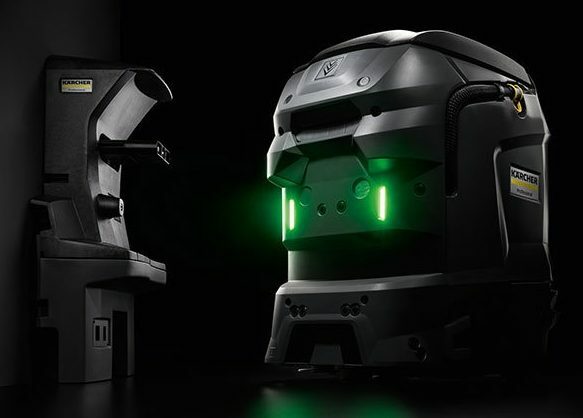 The company’s first robotic floor cleaner, the new “KIRA” (Kärcher Intelligent Robotic Applications) product series, won an Honorable Mention Award in the 2018 ISSA Innovation of the Year Award competition, and an ISSA Innovation Category Award in the Equipment category. The autonomous KIRA B 50 scrubber can be used affordably even in small spaces. It completes its cleaning tasks autonomously and, when necessary, returns to its docking station to recharge the lithium-ion batteries, empty the recovery tank and add fresh water. The initial mapping of the working area is said to be simple and easy to accomplish, after which the device is immediately ready for use. Depending on the application, the user can specify hygiene zones that require a deeper clean. KIRA B 50 is highly versatile regarding its scope of use including education, supermarkets and high-tech manufacturing and facilities. The new device category is part of Kärcher’s holistic approach that is targeted at designing the cleaning process of the future in a needs-oriented manner. The machine and the cleaning crew now work together in the best possible manner to improve the cleaning quality to new heights. KIRA was also the overall winner of the Amsterdam Innovation Award 2018, as well as winner of the Innovation Award in the Machines category, at the Interclean Amsterdam show in May [see the FMLink article]. With the WVP 10, Kärcher has developed a new window vac to meet the requirements of commercial operators. The machine is a practical addition for manual cleaning of glass doors, mirrors, smooth tables, countertops, windows, tiles and any other smooth surfaces. With the WVP 10, dirty water remaining on surfaces after cleaning is vacuumed away — streak-free and without residue. This machine is used by building service contractors in shops, public facilities, hotels and restaurants or at fuel stations. The window vac can be used with one hand. An advantage is the relatively low machine weight of 1.5 pounds, similar to a tablet PC. The on/off switch on the outside of the handle can be operated conveniently with the thumb. The 6.7-ounce recovery water tank is designed for both horizontal and vertical use without dripping. After use, it is simply removed from the machine and washed with clear water or cleaned in a dishwasher. The battery run time with one charge is about 35 minutes. An LED display above the on/off switch shows the remaining battery life. The battery can be charged for long periods of use with only short interruptions. The B 40 with ORB is a quiet, compact, fully customizable floor scrubber featuring new ORB technology. Thousands of orbital drive contact points provide the highest level of mechanical action on hard surfaces, making it possible to achieve best in class results using less chemicals, water and energy, which saves time, labor and resources. It has strong application for education, healthcare and hospitality facilities. 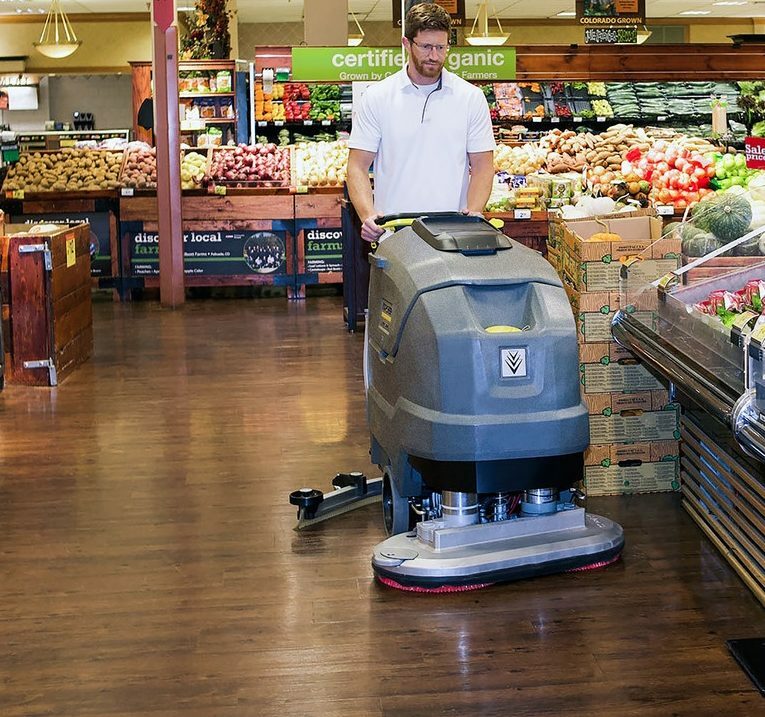 Quiet, strong and efficient, the B 40 w/ORB supports six different cleaning programs including eco!efficiency, an energy efficient and environmentally friendly cleaning setting, which is ideal for maintenance cleaning of most floors, operating with a reduced motor output and lower brush rotation speed, reducing noise level by up to 4 dB(A) and making it ideal for cleaning noise-sensitive areas such as schools, offices, hospitals and hotels. Dual orbital spin makes scrubbing floors easy with this cleaning product, says Kärcher. The B 40 w/ORB is engineered to save time, labor, and resources; one-person cleaning uses less chemicals, water, and energy. Additionally, very low vibration is transferred to the user. The B 40 scrubber’s interchangeable modular head design has been engineered for cylindrical brushes, traditional disc heads, and orbital disc heads to meet any cleaning challenge. Each can be changed quickly and without tools. Working widths range from 17 to 22 inches, and cylindrical brush decks include a pre-sweeping function, saving time and energy for user. The KIK system also offers better security against unwanted operation. 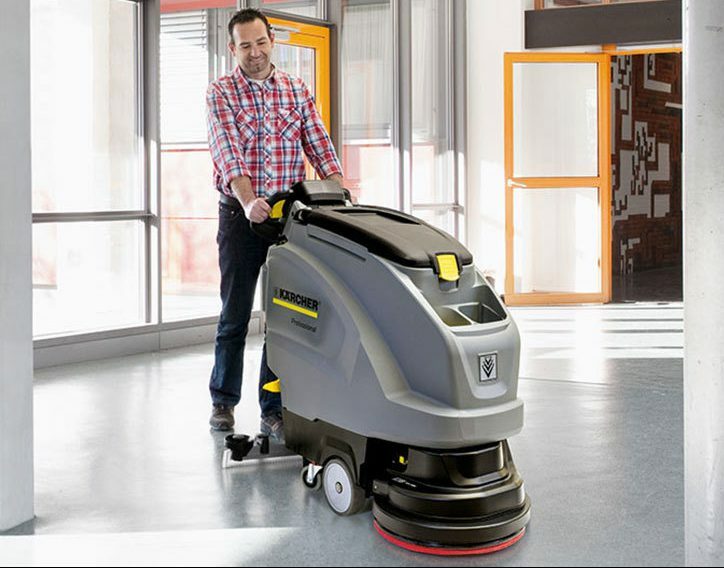 Facilities managers (FMs) can set parameters such as travel speed, brush speed, motor output or cleaning dosage to suit the needs of the particular cleaning task. Due to its ease of movement and cost point, the target markets for the easy-to-operate BD 80/100 W Bp Classic walk-behind scrubber are BSC (building service contractors), education, retail, airports, automotive, malls, convention centers and grocery stores. This is a lower cost, extremely maneuverable, 32” 27-gallon walk-behind scrubber that Kärcher says can go head-to-head with any machine on cost and performance and operator simplicity. Featuring up to 200 pounds of down pressure, the high-performing machine comes standard with fully adjustable transport speeds. It also boasts a cast aluminum deck for durability, and will be available with lead acid or AGM batteries to best suit user desires and needs. The scrubber will also be fleet management capable. 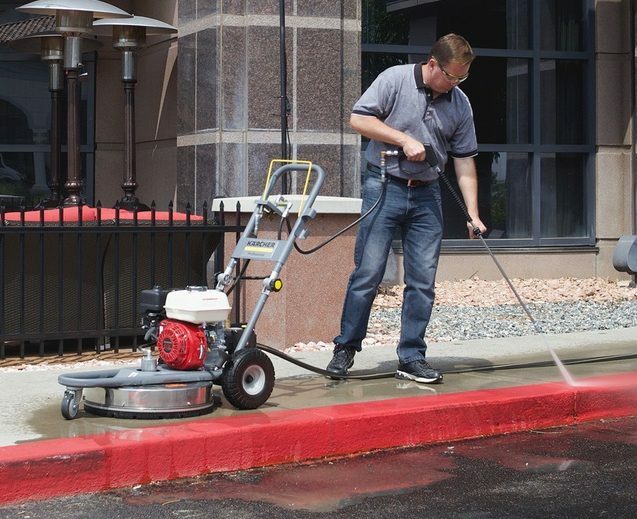 The Jarvis cold water, gas-powered, surface cleaner pressure washer is a complete solution for cleaning business entrances, parking lots, sidewalks and facilities. This easy-to-use pressure washer is an all-in-one unit with the pump and engine attached to the surface cleaner and is designed to attack the dirt sweeping alone does not get and for quick cleanup jobs between larger projects. The Jarvis is powerful, durable and embodies several smart features, such as reliable Honda GX engine with three-year warranty, a professional-grade direct-drive pump backed by a seven-year warranty, flat-free tires for effortless and reliable use, a conveniently located wand holder, a folding handle for easy storage and transport, and its simple on/off operation. Additionally, it boasts a thick and stiff bristle brush skirt to help keep debris out of the cleaning path, prevent nuisance overspray, and help reduce the noise level. The target markets for this unit include hospitality, Class A office, retail, education K-12 and universities, as it focuses on non-grease types of cleaning needs. This unit has a stainless-steel surface cleaner housing and a professional-grade swivel design for extended, effortless use. It has a mild steel frame with powder coat finish with powerful cleaning power up to 2500 PSI, and a professional direct-drive pump. The battery-powered KM 85/50 R is the new entry-level model in the ride-on sweeper range from Kärcher. It is an alternative for operators seeking a very compact and maneuverable machine, but who do not wish to compromise on convenience and speed. Important for professional use: the area performance/hour is about 30% higher than that of a walk-behind sweeper with the same working width. 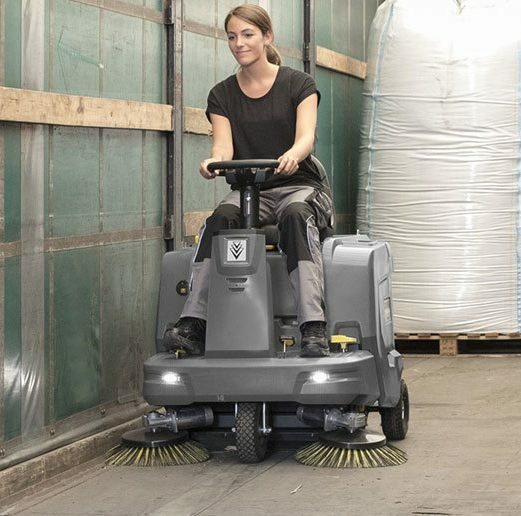 The battery-powered KM 85/50 R is the new entry-level model in the ride-on sweeper range from Kärcher, featuring ergonomic comfort, compact maneuverability and minimum maintenance effort. The machine can be equipped with a second additional side brush as required. The operator can adjust the rotational speed during operation to suit the type and amount of dirt. In addition to optimum cleaning performance, this results in reduced dust impact. The floating main sweeper roller requires no manual adjustment or wear adjustment by the operator. The contact pressure is automatically adjusted, and the roller adjusts to uneven surfaces. The dirt collected is divided evenly between two 6.6-gallon debris pans. This facilitates removal and transport of the full container for emptying. Thanks to the slim construction style and a working width of 33 inches with one side brush, this machine is ideal for cleaning in narrow corridors or between shelves quickly and conveniently. It also fits easily through doorways. The turning radius is less than 6.5 ft. The machine is suitable for indoor and outdoor operation. The seat position and steering column height can be adjusted for an ergonomic and fatigueless working posture. With self-explanatory symbols and clear imagery, the coherent and intuitive operating panel minimizes the possibility of erroneous operation. It is both sophisticated and practical; the Kärcher Home Base system offers supports and holders for further accessories. The main emphasis in the development of the KM 85/50 R was on minimum maintenance effort. If there is a loss of suction power, the filter cleaning can be activated conveniently during operation from the driver’s seat with a handle. A mechanical stripping system subsequently removes the dust from the filter segments very effectively. The filter and main sweeper roller can be replaced without additional tools. For more information on the new products, visit the Kärcher North America website. 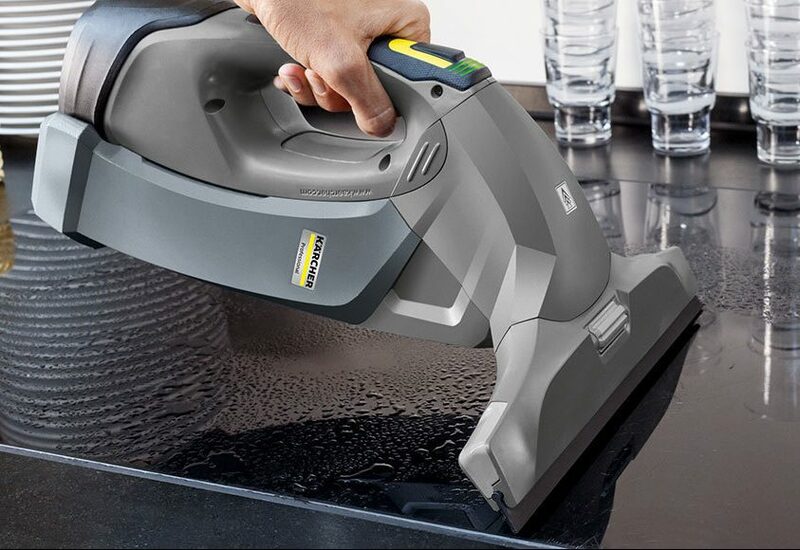 LEAN clean, productive machine—How productivity hacks are changing cleaning routines October 14, 2018 In "Magazines » FMJ"
Check out the best in today’s cleaning equipment and technology — Kärcher’s robotic scrubber dryer tops the 2018 Interclean awards June 8, 2018 In "Products and Services » Cleaning Equipment & Supplies"
Check out the ISSA Show’s award-winning cleaning innovations of all types — Hydro Systems takes top spot for its laundry chemical dispenser November 9, 2018 In "Products and Services » Cleaning Equipment & Supplies"
See what kinds of green janitorial services UG2 is providing for Stanford May 28, 2018 In "Contract Awards"